On a recent wandering through my local library (remember those? 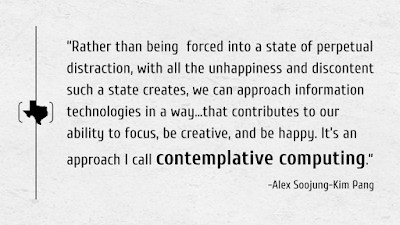 ), I stumbled on Alex Soojung-Kim Pang's book "The Distraction Addiction." I'm drawn to authors who challenge the prevailing wisdom on media and technology (see also McLuhan, Postman, and Lanier), so I added it to my stack of books. I'm glad I did. 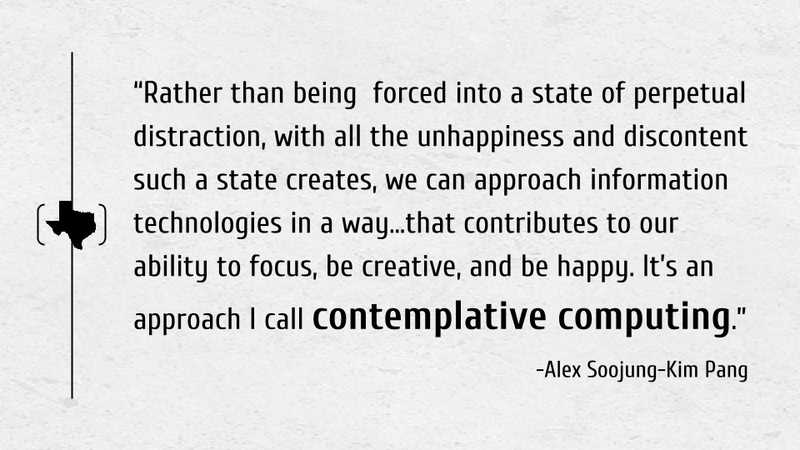 Pang, whose resume includes a PhD in the history of science, time as a Microsoft Research Fellow and a visiting scholar at Stanford and Oxford, steps outside of the rushing stream of data and dinging notifications that make up our daily lives and provides a much-needed perspective on technology he refers to as "contemplative computing." There are many examples Pang uses to emphasize the connection between technology use and its unnoticed effects on us. From "email apnea" (like sleep apnea, but where you unconsciously hold your breath when checking email) to the mental strain that comes from trying to keep up with unbounded streams of real time information, the link between our digital intake and mental health are becoming clearer. Knowing that, we must become more conscientious consumers of technology and media. In this vein, we also have to ask what our constant assault of social media is doing to our state of mind: is it an endless fountain of knowledge, or does it drive us to distraction, breaking our time into uselessly small chunks, and stopping us from doing deeply creative work? Everyone answers this differently, but Pang's point is that we need to be more intentional about our online engagement than we are right now. One immediate impact of "The Distraction Addiction" was that it caused me to reflect on my compulsive Twitter checking. I started questioning the feeling that I might be missing something life-changing if I'm not looking at my feed, and I began wondering if this is the best way to think deeply, enjoy my family, and live fully in the present moment. I've begun to realize that my current social media habits impact me more negatively than I would like to admit. I've already made some small changes to my social media rhythm, and I'm contemplating the best strategy going forward. I don't have the answer yet, but the point is that at least I've started thinking instead of just blindly doing. Beyond Pang, there are others who question the consequences of our daily digital deluge. In Cal Newport's superb article on creativity, he cites Nobel-prize winning physicist Richard Feynman and author Neil Stephenson as advocates for large blocks of protected time in order to do "deep work." Stephenson cites these blocks of time as the reason he doesn't engage in social media conversations. He says he works to organize his life "in such a way that he can get lots of long, consecutive, uninterrupted time chunks...." For Feynman, performing such feats as furthering the field of quantum electrodynamics and predicting the future of nanotechnology required removing all distractions, creating time to think deeply and produce meaningful results. And it's not just the frontiers of physics that require distraction-free time for deep, creative thought. In his book Drive, Daniel H. Pink points out that only 30 percent of job growth now comes from what he refers to as "algorithmic" work: work for which there is "a set of established instructions down a single pathway to one conclusion." By contrast, 70 percent of job growth comes from "heuristic" work: work in which you have to experiment with possibilities and devise a novel solution. For most of us in educational technology, we fall into the "heuristic" category, where the challenges we face require focused time to develop creative solutions. But our interactions with technology often create exactly the opposite: fragmented days, full of shallow, ineffective task-switching with no time for extended reflection. It's because of the need to create space for deeper thought that Pang calls us to start contemplatively considering how we interact with the digital world. 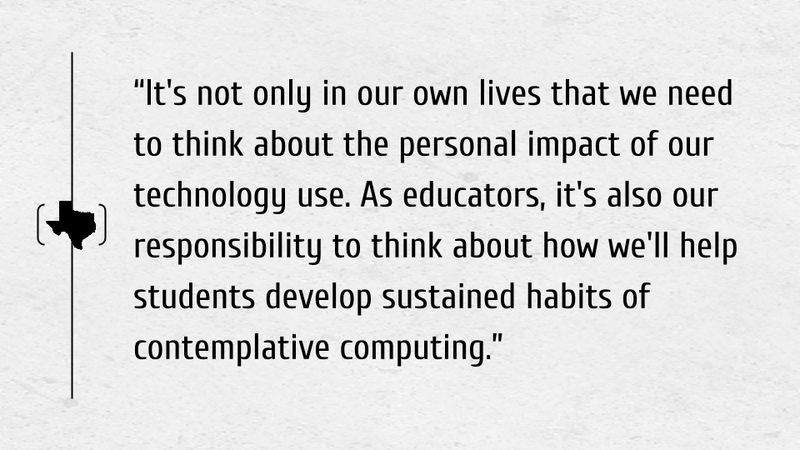 It's not only in our own lives that we need to think about the personal impact of our technology use. 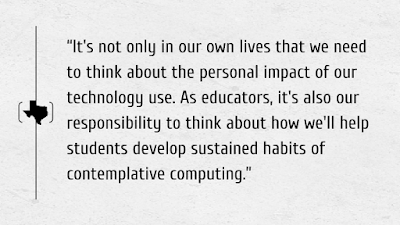 As educators, it's also our responsibility to think about how we'll help students develop sustained habits of contemplative computing. There are three ideas we should start with. First, we need to teach our students that they are humans, not computers. And as humans, they require a significant amount of processing time. Pang quotes futurist Anthony Townsend: "Minds, organizations, cities, entire societies all need time to integrate and process ideas. If you think you have to constantly, instantly react, rest and contemplation and deliberation--the ability to think about what you're doing--disappears." I wonder what happens when we constantly have students tied to digital tools, or we replace human interaction with isolated, online activity. Because of the breakneck speed of our test-happy education system, this often replaces taking time to reflect and think, away from backlit illumination, 140 character snippets, and self-destructing photographs. I'm as guilty of this digital immersion and rapid pacing as anybody, so I wonder how we balance our over-tested digital natives' love of screens with a protected space to sit a while, wonder, and process. They need time to think robustly about what the things they're learning actually mean in relation to their world. Secondly, we need to teach students that when they do use technology, it should be to produce high-quality work that stems from reflection, thought and planning. In his book You Are Not a Gadget, Jaron Lanier offers some ideas about resurrecting personhood in the world of Web 2.0. One idea he offers is "posting a video once in a while that took you one hundred times more time to create than it takes to view." Think about what a difference it would make if our students started following just that one principle. 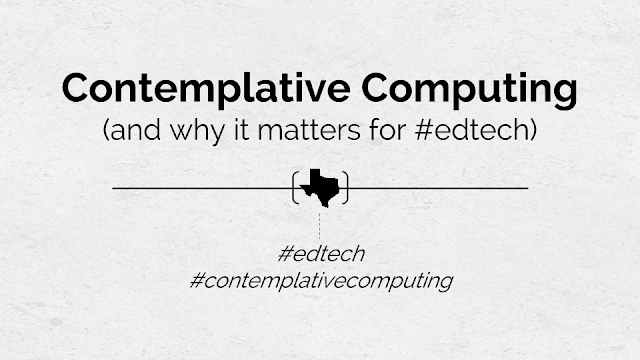 If we can lead our students to produce thoughtful, reflective work, we've directed them toward the calmer waters of contemplative computing. We've also brought them a step closer to making sure that what they offer the digital world has substance and value, and isn't just a reflex where they produce high-volume, low-quality content simply because they can. Finally, we should consider modeling digital Sabbaths in our classroom. When districts invest in technology, there's a great deal of pressure to make sure it's used as often as possible. The people with the purse strings want to make sure the expense is justified. But is this the best way to determine when to use technology and when to leave it in the cart? Instead, we need teachers and administrators who say that every day doesn't have to be lit by the glow of a screen because there are other, and often better, ways to learn. When we show students that we are intentionally cutting our Ethernet umbilical cord for the day, we can start to have genuine conversations about how technology is affecting their quality of life outside of the classroom. Hopefully, students will start to adopt the idea of a regular, technology-free space in their own lives. Pang calls us to explore the effects of our technology use on our quality of life, whether or not our pursuit of constant connection aligns with our deepest goals, and how profoundly the quality of our work is impacted in a world of constantly accessible distraction. Contemplative computing needs to become our mindset, a filter to use as we evaluate new technology, whether it's for personal or classroom use. Pang closes out his book by saying "Connection is inevitable. Distraction is a choice." These seven words are worth contemplating as we evaluate our own technology use. Additionally, they're worth teaching students as we help them navigate their media-soaked reality. To make our students thoughtful producers instead of mindless consumers, contemplative computing needs to become a cornerstone of our edtech implementation, and Pang is a strong voice to lead the way. Math is the study of patterns, and there are few places that's clearer than multiplying and dividing positive and negative numbers. The beauty of a tool like Google Sheets is that students now have a place to explore integer relationships and discover these patterns on their own. In a previous post, I showed how Sheets can be used to help students explore the patterns produced by integer addition. By comparison, the rules for multiplication and divisions (same signs = positive, different signs = negative) are relatively straightforward. In this Sheet, students input positive and negative factors into the multiplication rows first, then answer the questions using the dropdowns. These are color-coded to make the patterns easy to recognize. The division sheet will be populated with the related multiplication sentence from the first sheet. Both sheets have an area for a written reflection on the patterns students uncover. The directions for using this sheet are pretty much the same as for the addition activity, so I simply refer you to that post for directions. To make a copy for your Drive, click here.